12/15/2016 | Articles | Zanon, O., Ius, M. & Milani, P.
From the beginning of the Twentieth Century, thanks to having adopted an experimental method, the essays on several theoretical perspectives, above all dealing with psychology and pedagogy, significantly contributed to gaining knowledge regarding child development. Together with the gradual specialization of the various disciplines, clear distinctions and hierarchies between the different fields of knowledge and of their pertaining professionalism on interventions during childhood simultaneously arose, in especial connection to the relationship between areas regarding health or education support. More recently, specifically because of the systemic perspective, psychological, social and educational studies have theorized on the importance of integration of the different dimensions of child development, so as not to disperse the “hundred languages of children” (Edwards, Gandini, Forman, 1999). The bio-ecological approach of human development conceptualized by Bronfenbrenner (1986, 2010) has moreover, asserted how a peaceful and comprehensive development of the children is supported by the cooperation of the “mesosystem” between all the adults involved in the care of the selfsame children. This theoretical framework which pays major attention to the variables of background has brought into being a relational concept of child development which one must consider when working on the child’s education and especially in the case of protection by the welfare-social and educational services because of negligence or child abuse. The ecological-relational perspective does not only take on the protection of the child but the “whole world of the child” made up of his/her emotional bonds and by the links which are established between each other (Serbati, Milani, 2013). The in-depth analysis of this article specifically regards vulnerable family situations which reveal the alleged “parental neglect” meant as “a significant deficiency or failure to respond to the needs of the child’s needs which are acknowledged as fundamental, on the basis of the current scientific knowledge or/and social values adopted by the community in which the child lives” (Lacharité, Éthier, Nolin, 2006, p. 384). The term “neglect” etymologically derives from nec-ligere, which means “not attach” and “not choose”, and therefore reveals the difficulties on the part of adults in identifying the developmental needs, (and in some cases the abilities), of children and positively responding to them. According to this ecological and dynamic concept, the critical factors which are at the base of parental neglect place themselves on two different sides of the family relationships: between parents and their children and between the family and its social context. As a consequence, the most efficient interventions in preventing and reducing negligent behavior on children do not correspond to increasing the number of interventions not coordinated one to the other but instead in supporting which implies the participation and collaboration of everyone who has a role in the “child’s world”, beginning from the family itself. Organizational variables, which very often cause pragmatic restraints as regards to the programming of inter-professional and inter-institutional meetings and slow down the flow of information and the decision-making processes shared between services. The real challenge nowadays, in child care and protection, is that of contemplating the variety of points of view and professional interventions as the necessary conditions to encompass the “child’s world” and therefore elaborate the most pertinent method to support his/her development. Bronfenbrenner believes that this professional (and personal) attitude of listening and negotiation is the principle guarantee for scientific progress: “The question will be whether we have the ability and the wisdom to deal with the complexity of phenomena which we are attempting to find out about. If we persist in letting things go towards fragmentation, towards an increasingly marked division between the various segments of society, our knowledge might undergo a regression. I think that both of these regressions can be avoided as nowadays we are beginning to understand fairly well which essential efforts are needed to tackle with the widespread tendency of disintegration and therefore allow us to go ahead” (2010, p. 113). In this paper we will to refer, in particular, to the preventive and promotional role which educational services in early childhood can play in their daily intervention in favour of children in situations of family negligence (Zanon, Serbati, Milani, 2015). We will further on describe an exemplifying experience where the team building of forms of joint responsibility between the child care and protection services, the social and educational services and a mother have made it possible to establish a care path for the child and its mother, which proved to be effectual for the development of an improved well-being for all the family and for the professionals, too. Research and background data of services related to early childhood confirm how the actual number of “delicate” children is getting increasingly higher and higher and who report even if only temporarily some form of uneasiness, specifically on an emotional-affective and behavioural level (Bombèr, 2012; Ongari, Tomasi, Zoccatelli, 2006). The familiarity of an uninterrupted relationship established on a daily basis between the child aged 0 to 3 and its educators, (including the staff that takes care of the auxiliary services and preparing food), do indeed make the early childhood services a privileged place for an early assessment and response to the “regular” or “special” developmental needs during childhood. The recent concepts of developmental psychology and notably regarding the construct of resilience (Cyrulnik, 2009; Milani, Ius, 2010), have in fact reconsidered the correlation which until recently was held to be almost deterministic between the negative experiences in early childhood and the problematic nature of his/her future life. The internal protective factors, both the domestic and social ones are in fact able to compensate the effects caused by the difficulties encountered and stimulate new opportunities of rehabilitation and of positive self-realization of the person. Thanks to the early childhood ability of establishing multiple or “light” attachments with the different adult educators (Cassibba, Van Ijzendoorn, 2005), where there are cases of children living in family and social contexts of emotional or physical deprivation, the childcare educators can therefore take on the role of “resilience tutors” in order to heal the wounds and trigger off new hopes and abilities in them (Ius, Milani, 2011). For this reason, early childhood services represent a fundamental crossroads for the network of services dedicated to the protection and care of the child and they can intervene with a vast list of preventive and repairing actions addressed both to children and their families. As already mentioned in the paragraph above, according to the bio-ecological approach, the support given to child development is achieved above all, by binding stronger relationships between him/her and his/her parents within the social context, therefore the contribution given by early childhood services to the child’s life plan directly involves the child’s parents, too. Educators have many opportunities to encounter parents, (all the parents), moments both during the day or over the entire school year, where they can blaze together new trails for major attention or for further thought on the development of their child. This continuous exchange can count on childcare services with several facilitating factors, as the bonding and intimacy which is created in families when sharing the care of a young child starting from the delicate settling-in period (Milani, 2010). Moreover, the educational purpose and not directly the “therapeutic” one of ECS is able to significantly reduce the parents’ fears of having an “abnormal” child and consequently of recognizing their parenting skills, when aspects of vulnerability are noticed. From the inside of a positive relationship, it is much easier to invite families to turn to other local specialist services, in the case in which the educational intervention carried out at ECS is considered to not be adequate enough for the child’s needs. The part of the programme regarding the partnership between the educational, social-welfare services, the early childhood services and the schools attended by the child, and the family itself is considered to be a fundamental methodological principle and a predictor of the efficacy of family care path. 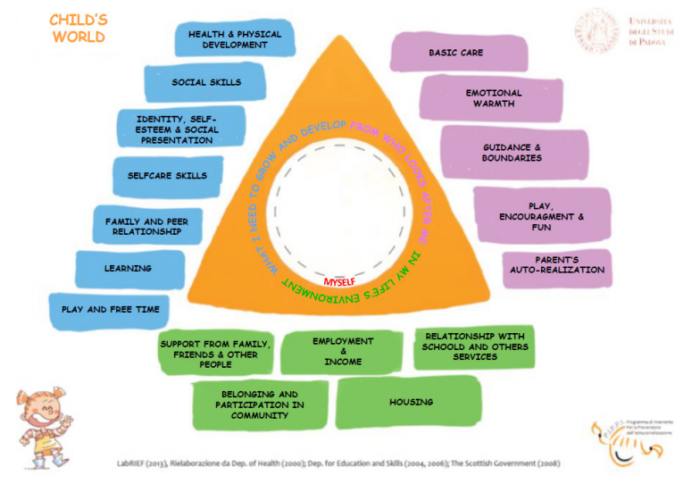 In order to work with families within the approach of participative and transformative evaluation (Serbati, Milani, 2013), professionals use RPMonline, a web interface developed by LabRIEF and C.S.I.A. (Information Technology Centre, University of Padua), which supports all the different steps of the work developed within families and the programme evaluation, by linking together the “social” and “informational” requests of professionals’ work (Parton, 2008). 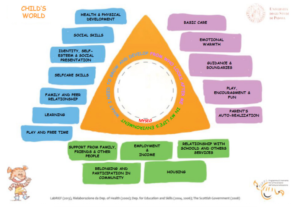 RPMonline is based on the Italian adaptation of the British Common Assessment Framework (Parker, Ward, Jackson, Aldgate, & Wedge, 1991, Department of Health, 2000), so called the Multidimensional Model of the Child’s World and has a triangular structure with the three sides representing the 3 dimensions of Environment (base), Child’s needs and parental responses to child’s needs, and 7, 5 and 5 sub-dimension accordingly (in order to allow the reader to see the different version of the triangle, in the figure below, the version with professional language is reported, later the graph reports the sub-dimensions’ titles belonging to the child version). All the professionals of the Multidisciplinary Team working with a child and family cooperate and document their work in a child-dedicated RPMonline space, where during the three periods of time within the implementation (T0, T1, T2), they register for all the 17 sub-dimensions, both qualitative assessment – putting together the voices of the different actors and negotiating a common meaning – and quantitative assessment (The Child’s World Questionnaire CWQ) – using a six-point Likert-scale where 1,2,3 go from serious, moderate, slight problem, 4 is baseline/adequate, and 5, 6 mild, clear strength (Serbati, Ius, Milani, 2016). Furthermore, they can micro-plan outcomes to reach the sub-dimension where together they can define the need to change or improve something or to empower a strength, and to evaluate the outcomes of intervention. Data of the CWQ and of the results of micro-planning outcomes are used to evaluate intervention. The experience herewith illustrated, was carried out within the work done by the services in charge of child care and protection of a town participating in P.I.P.P.I. After a brief description of the family history and situation at the report time, here below is reported a part of the information on the results obtained and the processes of the family care path, with particular reference to the role played by the early childhood service in the work carried out by a multi-professional team. The quantitative outcomes will be described using the CWQ results data, and later the case will be presented qualitatively by a narrative reporting the voices of the mother and professionals that were gathered through brief interviews during the final assessment, and that will be reported in italics. The Mutidimensional Model of the Child’s World (professional version). Published by permission of the authors. The protagonist of this case study is a one-parent family that participated in the P.I.P.P.I. programme, composed of a mother aged 27, Lidia, of Eritrean nationality, and her ten-month-old son who we will name Francesco. Lidia is a young woman who at the age of 18 escaped from her country, where she had been living with her parents, so as to avoid the calling to arms. She settled in Italy after having wandered for several years in various countries. With the help of a compatriot, she found a job as domestic help and accommodation through a landlord in a basement flat. It is in this sort of cellar that Francesco is brought up during the first months of his life. Right from the start, the mother began worrying about her child’s state of health and she often turned to the emergency ward at the hospital, even for the most common ailments which the pediatrician could have easily dealt with. Exactly because of this, social and health services found out about the situation regarding the family and activated a path of support: mother and child were initially allocated to a residential service and then eventually assigned a house in the residential public housing. During this initial phase of acquaintanceship between the mother and the social and health services, the professionals became increasingly aware of the effort experienced by this young woman who, without being able to rely on any type of family or social network, found herself alone in facing the requests of a young child whom she has a very strong relationship with. Moreover, Lidia seemed to be very worried about guaranteeing the financial needs for her son and therefore was highly apprehensive about losing her job. She consequently worked a lot and was very much concerned about whether her little one was unhappy without her, so much so, that when she was away from home she called her fellow countrywoman friend with whom she had entrusted her child to, very frequently. Henceforth, when Francesco was alone at home with her, she constantly kept him in her arms and complied to any of his requests. Furthermore, because she was torn away from her cultural context and from the knowledge on child care which belongs to her country of origin, the mother lived in a situation of discomfort and uncertainty and found it difficult to undertake, in certain circumstances, well-treating behaviors with her child (Barudy, Marquebreucq, 2005; Pourtois, Desmet, 2004). As a consequence, she appeared to reveal to child care and protection service, “a significant deficiency or a lack of response offered towards the child’s needs” (Lacharité, Éthier, Nolin, 2006, p. 383). The social services, which were already taking part in the P.I.P.P.I. programme, therefore suggest that Lidia should participate together with Francesco to it, so as to help them develop a positive relationship and improve their level of integration in the social context. 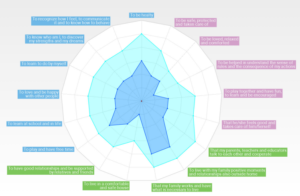 The following radar graph illustrates the quantitative assessment at T0 (blue) and at T2 (light blue) and allows one to visualize the improvements obtained in the situation of Francesco’s “Child’s World” which was activated thanks to the intervention. We may consider that as regards to the sub-dimensions of the “Child’s needs”, the step of an assessment of the problem from “moderate or light” to a level of “normality” occurred in all the sub-dimensions except for “to be healthy” which moved from a light problem to a mild strength one and “to play and have free time” which goes from being a light problem to an adequate one. In relation to the “Family” aspects which refer to what the person (parents and/or carers) taking care of the child does to adequately respond to his/her needs, an improvement is highlighted (from 2 to 4) in the sub-dimension “to be safe, protected and taken care of”, “to play together and have fun, to learn and be encouraged” and “that my parent/carer feels good and takes care of him/herself”, an improvement from a level of seriousness to one of normality in the area of “to be helped in understanding the meaning of rules and the consequences of one’s actions” and an improvement in the quantitative assessment from 2 to 3 as regards “to be loved, relaxed and comforted”. In the Environmental dimension, the aspect “to live in a comfortable and safe house” varies from a level considered to be a serious problem to one considered as a light problem and “to have good relationships and be supported by relatives and friends” goes from 2 to 4. The sub-dimensions “to live enjoying positive moments with my family and also build relationships outside home” and “that my family works and has what is necessary to keep going” become a light advantage point, starting from an initial situation of inappropriateness and in the sub-dimension “that my parents, teachers and educators talk to each other and cooperate”, there is an improvement that goes from a moderate problem to a light advantage point. Lidia states, regarding her situation, right from when the care path began that: “At the beginning, I knew very few Italians and I often found myself in difficult situations and I didn’t know what to do and got confused” (mother). This young immigrant woman didn’t trust the social workers, who were, in their turn, wary about her “parent skills” and had considered it would be medium risk to place this child out-of-home and that there was the necessity to immediately intervene with a home care educator. The mother explicitly refused to benefit from this intervention as she was not able to fully fathom the benefits and the meaning she would gain in having this person at home. Moreover, Lidia neither wanted to nor could go to the child psychiatrist to assess the child’s development, which had been requested because of the growing concern manifested at the early childhood service on a possible retardation regarding Francesco’s cognitive and motor development. In line with the principle of participation which underlies the programme P.I.P.P.I., the professionals chose to not undertake a symmetrical position with the mother and to respect her opinion, suggesting that the educator should initially only go to the early childhood service. Therefore, “a delicate and extremely welcoming approach, allowing the parent to introduce him/herself and to feel confident” (ECS educator). Monitoring the needs and the mother’s ethnic and educational “culture” (Favaro, Mantovani, Musatti, 2006; Ungar, 2008) executed during the first part of the path, most probably contributed in reassuring her on the goals the educational intervention had and enabled her eventually to authorize the educator coming to her home, “As time went by, the level of trust between us deepened therefore the mother in some ways “opened the door” of her house and accepted the presence and help of a home care educator, who intervened both at our service and at home” (ECS educator). The partnership between the family and the social and health services triggered off a series of significant improvements on some other aspects of the child’s care, “the mother who was busy at work wasn’t able to find the time to take Francesco to the child psychiatrist’s surgery to assess his development. The collaboration between the social and health services enabled the organization of an observation point on the part of the child psychiatrist directly at the early childhood service. Francesco, in fact, was rarely motivated by his mother and this behavior did not favor his cognitive and motor development. As a result, the home care carried out both at the ECS and at home helped Francesco to improve in both these fields of development” (social worker). This action on the part of the services towards the family’s “zone of proximal development” (Vygotsky, 1954) revealed to be extremely important, as it built “bridges” between the micro-systems and meso-systems: between the home and the early childhood service, the family and the professionals and between the services (Bronfenbrenner, 1986, 2010; Serbati, Milani, 2013). Radar graph regarding Francesco’s “Child’s World”: levels recorded at T0 and at T2 (child version sub-dimension titles). Published by permission of the authors. This attitude of enhancement of the family’s point of view regarding its situation was engineered thanks to the integration of the different professionalisms, “the periodic meetings of the team facilitated an excellent exchange of information: the fact that everyone involved had the same common and explicit goals favored their achievement even through the adoption of alternative personalized paths intended for a particular situation. Because of this collaboration, the mother who participated to the team meetings, was priceless” (social worker). The cooperation between the services and parents for the achievement of a unanimous plan “raised the awareness at the ECS in considering the child’s needs, and also helped the mother in identifying other needs the child had other than those she contemplated as being important” (child psychiatrist). Professionals constantly state the fundamental effect comparing information and negotiating can have on the results obtained by interventions, “The exchanges and relationships between the ECS educators, the home helper and the other social and health services involved were key to the success of the plan. Furthermore, in this case, the fact that an alternative strategy was all together thought of, contributed to working in the same direction, well aware of what the conditions and difficulties were. Periodically debating on the evolution of the plan, allowed one to “adjust the shot” and definitely made the intervention more effective” (ECS educator); “Initially, just as an observer, I was able to report to the ECS educators and to the services the family’s resources and critical situations and thanks to a close contact between the different workers, we were able to piece together little strategies of intervention so as to strengthen the present moment abilities and minimize the critical situations” (home care educator). The innovative results of this “creative” method, with which a situation presenting a difficult parent was dealt with, is herewith summarized, “I believe that by a traditional approach to home care, we would never have managed to get inside Francesco’s house” (social worker). The challenge undertaken by the services in this situation was that of decentralizing one’s own vision of the circumstance, suspending judgment and carefully reviewing one’s way of thinking “This family doesn’t want to be helped” with a more productive assumption which says that “what lies beyond a refusal may be based on real or fantastic justifications which can make a form of “support” look like a threat for a parent” (child psychiatrist). Modifying one’s “punctuation” of how one observes one’s reality (Watzlawick, Beavin, Jackson, 1971) has contributed to substituting a hierarchical and theoretical assessment of this mother’s “responsibilities” with a far more circular and speculative interpretation of the relationship which had established itself inside this family. The changes in their procedures all came from disputing in inter-subjective discussions on the part of professionals regarding their habitual “epistemology”. The intervention did not have the purpose of “solving the problem” immediately and in a standardized way but to create, first of all, the conditions in which the mother’s “voice” could help the services, all the services, in understanding whatever forms of support she believed to be acceptable in the framework of her biography and her universe of meanings (Milani, Serbati, Ius, 2015). The fact that one “had to slow down supporting, respecting what the mother could accept as a form of help” allowed one “to stop and attempt to understand what help means for a person or for its background” (child psychiatrist). This concern made it possible for Lidia to say at the end of this path: “Now I feel much more relaxed and I am able to do things better for my child whilst before I thought I wasn’t able to do so” (mother). Barudy J., Marquebreucq A. P. (2005). Les enfants des mères résilientes, Solal Editeurs, Paris. Bombèr L. M. (2012). Feriti dentro. Strumenti a sostegno dei bambini con difficoltà di attaccamento a scuola, Franco Angeli, Milano. Bouchard J.M. (2002). Partenariat et agir de communication. In V. Guerdan, J.M. Bouchard, M. Mercier, Partenariat, chercheurs, praticiens, famillese, Les Editions Logiques, Montréal. Bronfenbrenner U. (1986). Ecologia dello sviluppo umano, Il Mulino, Bologna, ed. orig. 1979. Bronfenbrenner U. (2010). Rendere umani gli esseri umani. Bioecologia dello sviluppo, Erickson, Trento, ed. orig. 2005. Cassibba R., Van Ijzendoorn M. (eds.) (2005). L’intervento clinico basato sull’attaccamento. Promuovere la relazione genitore-bambino, Il Mulino, Bologna. Cyrulnik B. (2009). Autobiografia di uno spaventapasseri. Strategie per superare un trauma, Raffaello Cortina, Milano. Edwards C., Gandini L., Forman G. (1999). I cento linguaggi dei bambini, Edizioni Junior, Bergamo. Favaro G., Mantovani S., Musatti T. (eds.) (2006). Nello stesso nido. Famiglie e bambini stranieri nei servizi educativi, Franco Angeli, Milano. Guerra M., Luciano E. (2009). La relazione con le famiglie nei servizi e nelle scuole per l’infanzia, Edizioni Junior, Azzano San Paolo (BG). Ius M., Milani P. (eds.) (2011). Educazione, pentolini e resilienza, Kite Edizioni, Piazzola sul Brenta (PD). Lacharité C., Ethier L., Nolin P. (2006). Vers une théorie écosystémique de la négligence envers les enfants, Bulletin de Psychologie, 59, 4, 381-394. Milani P. (ed.) (2008). Co-educare i bambini. Genitori e insegnanti insieme a scuola, Pensa MultiMedia, Lecce. Milani P. (a cura di) (2010). Un tempo per incontrarsi. Pensieri e pratiche per favorire l’ambientamento di bambini e genitori nella scuola dell’infanzia, Kite Edizioni, Padova. Milani P., Ius M. (2010). Sotto un cielo di stelle. Educazione, bambini e resilienza, Raffaello Cortina Milano. Milani P., Serbati S., Ius M., Di Masi D., Zanon O., Ciampa A., Tangorra R. (2014). 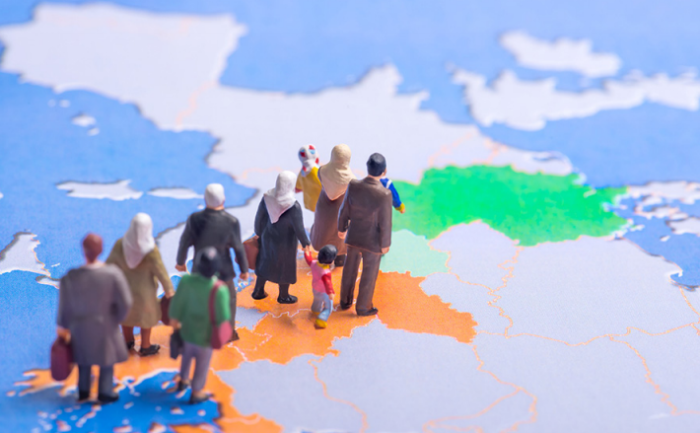 Innovative practices with marginalised families at risk of having their children taken into care, Peer Review in Social Protection and Social Inclusion, European Commission, https://ec.europa.eu/social/BlobServlet?docId=13391&langId=en. Milani P., Serbati S., Ius M. (2015). La parole vivante et la parole morte: le parcours accidenté de la parole des enfants et des parents vers l’action. In C. Lacharité, C. Sellenet, C. Chamberland (éd), La protection de l’enfance. La parole des enfants et des parents, Québec, Presses de l’Université du Québec,125-135. Milani P., Zanon O. (2010). La relazione fra servizi educativi e sociali: fattori che ostacolano e fattori che proteggono la crescita dei bambini. In A. Garbarini, M.A. Nunnari (a cura di), I diritti dellebambine e dei bambini, Edizioni Junior, Azzano San Paolo (BG),61-69. Ongari B., Tomasi F., Zoccatelli B. (2006). Bambini a disagio nel Nido e nella Scuola dell’Infanzia. Un percorso di formazione all’osservazione e all’intervento individualizzato, Edizioni Junior, Azzano San Paolo (BG). Parker R., Ward H., Jackson S., Aldgate J., Wedge P. (1991). Looking after Children. Assessing Outcomes in Child care, London, HMSO. Parton N. (2008). Changes in the Form of Knowledge in Social Work: From the “Social” to the “Informational”? British Journal of Social Work, 38(2), 253–269. Pourtois J.P., Desmet H. (2007). L’educazione post-moderna, Del Cerro, Pistoia, ed. orig. 2004. Serbati S., Milani P. (2013). La tutela dei bambini. Teorie e strumenti di intervento con le famiglie vulnerabili, Roma, Carocci. Serbati S., Ius M., Milani P. (2016). P.I.P.P.I. Programme of Intervention for Prevention of Institutionalization. Capturing the Evidence of an Innovative Programme of Family Support, Revista de Cercetare si Interventie Sociala, 52, 26-50. Ungar M. (2008). Resilience across cultures. British Journal of Social Work, 38(2), 218-235. Vygotskij L. (1954). Pensiero e linguaggio. Ricerche psicologiche, Firenze, Giunti-Barbera, ed. orig. 1934. Watzlawick P., Beavin J.H., Jackson D.D. (1971). Pragmatica della comunicazione umana. Studio dei modelli interattivi, delle patologie e dei paradossi, Astrolabio Ubaldini, Roma, ed. orig. 1967.